Aw yeah, pancakes! The Itty Bitty Hellboy Mini-Bust Statue is based on the amazing art of Art Baltazar, who with Franco, is behind the Eisner-winning itty bitty Hellboy, published by Dark Horse Entertainment. This officially licensed mini-bust is approximately 3 3/4-inches tall. 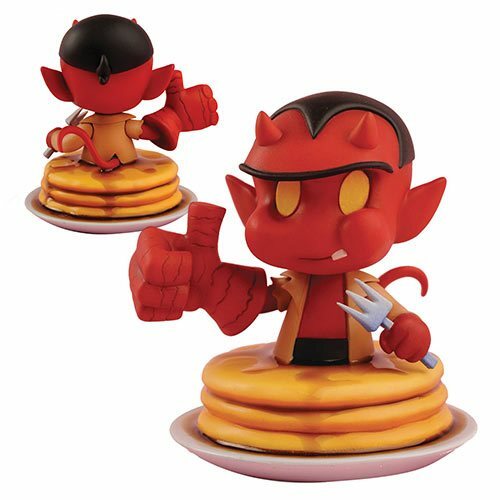 Itty Bitty Hellboy is featured with his trademark smirk, giving a thumbs up on a big stack of buttery, syrupy pancakes. Itty Bitty was designed by Israel Skelton and Art Baltazar and sculpted by Arlen Pelletier.